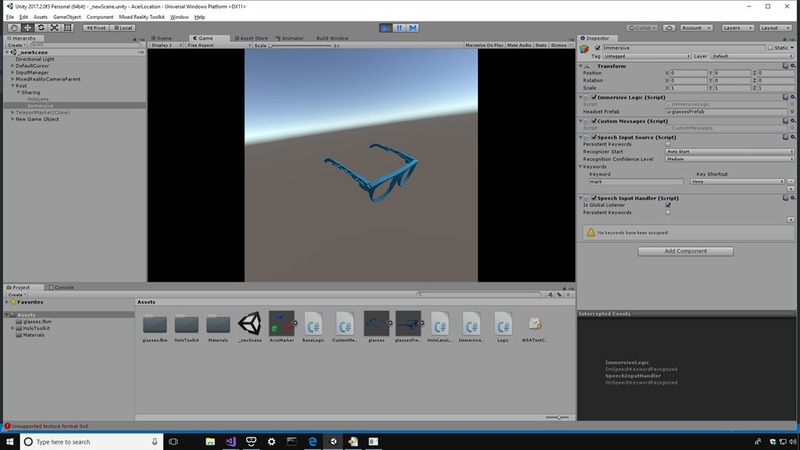 Just a small update to a recent post where I used the sharing service from the Mixed Reality Toolkit in order to experiment with the idea of creating a common co-ordinate system between an app running on an immersive Mixed Reality headset and the same app running on the holographic HoloLens headset. As part of that, I had the immersive headset broadcast its position to the HoloLens such that the HoloLens could track it as it moved around. It seemed obvious that this should also work in the other direction – i.e. the HoloLens could also broadcast its position such that the immersive headset could track it as it moved around and so I’ve modified the code to make that change. The screenshot below shows capture from the Unity editor where the app is running on an immersive headset and the glasses represent where the immersive headset thinks the HoloLens is in the ‘real’ world around it – it seems to work reasonably well.